Throughout my cycling life I’ve bought my cleated shoes at a deep discount through bike shop connections. My last pair cost like $100, five years ago, and my heart has soared like a hawk throughout that period. But my bike club’s shop sponsor, Left Coast Cyclery sadly folded this year, and my brother Max’s bike connection, a shop we affectionately call Loserville, finally cut him off from the family discount. (I can’t blame them; he last worked there in 1996.) Alas, my recent purchase was (gasp!) at full retail. My wife Erin is as accustomed to sweet deals as I am, so when I mentioned what I was looking to pay she was taken aback. My timing with this purchase wasn’t very good either; after our family’s rather expensive recent train vacation, we’ve embarked upon a Period of Austerity in an attempt to avoid foreclosure on our home, etc. Still, my old shoes were completely thrashed and Mike’s Bikes was having a big sale so this couldn’t wait. After bristling slightly at the price range I was looking at, Erin asked, reasonably enough, if I had to have the top of the line. I couldn’t use my old standby argument, which is touting the greater dependability and thus safety of expensive bike gear. That works fine for brakes, wheels, and tires, but I doubt anybody ever crashed because his shoes weren’t good enough. Still, I wasn’t too worried about getting my wife’s buy-in, because she’s no stranger to expensive shoes. 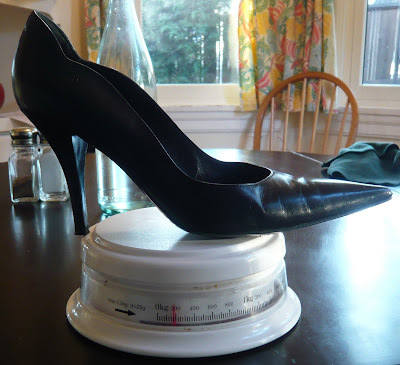 Some years ago we had a similarly uncomfortable budgeting discussion when she wanted to get some stiletto heels. They were absurdly expensive. In fact, just now I looked at the price tag (still on the box), and discovered that the shoes were even pricier than I’d remembered. My brain must have sheltered itself from the awful truth, or perhaps on some level I’ve never believed what they actually cost, but suffice to say they were brutally, devastatingly expensive. Anyway, I figured as a last resort I could bring up those stilettos; if Erin still balked at the price of my cleats, the irony would be so thick we’d practically drown in it. To more diplomatically bolster my case, I mentioned how long cycling shoes last, and then—inspiration!—I sifted through my training diary for the past five years and calculated that I put 24,000 road miles on my last pair of shoes, in addition to more than 150 indoor trainer rides. At the latitude of the Bay Area, 24,000 miles will take you all the way around the earth. Erin was suitably impressed, so I didn’t even have to come out with “How many miles have you logged in your stilettos?” which probably wouldn’t have helped my cause anyway. 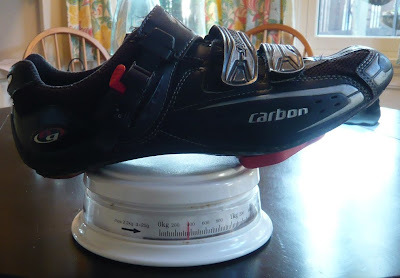 My cycling shoes need to be fairly light, quite stiff, and most of all aren’t allowed to hurt my feet. Of course, it’s hard to predict whether or not a shoe that feels good in a ten-meter walk around a bike shop will still feel good after a hundred miles of riding. It’s a bit of a gamble, every time. Note that I don’t particularly care if my shoes look good. Italian shoes—and aren’t Italian shoes the gold standard, like Swiss watches and Belgian beer?—have a history of coming only in colors that, though stylish to the Italians, are grotesque to Americans. You might get green, pink, and blue on the same shoe. I had some Lake shoes that I really liked, and they were baby blue and white, which wasn’t exactly macho. Fortunately, Andy Hampsten wore them the same year I did, and won the Tour of Italy. If I couldn’t have his class, prestige, strength, and results, at least I could have his shoes. This time around I figured I’d just get exactly the same shoes I bought last time: the Specialized Pro. Alas, Mike’s Bikes only carries them in white. Wait—didn’t I just say I don’t care about looks? Well, white cycling shoes … that’s just a bit too Liberace for me. I realize I have a real chance of alienating my white-cycling-shoe-wearing albertnet readers (if any), so let’s just say the shoes look fine on others but I don’t think I could carry them off myself. Besides, my bike is grey and black! Ah, but Mike’s had the higher-end Specialized S-Works shoes in black. The S-Works is an ugly shoe, and (as I said before) a very expensive one, but it wasn’t hard for the salesman to upsell me. (I’m kind of weak like that. Just like with taxes: show me a new one and I’ll vote for it every time.) I asked if the S-Works shoes were comfortable. “Ridiculously comfortable,” the guy said. I reckon this was my twelfth pair of road cycling shoes. (Not bad for thirty years of cycling.) My first pair was the coolest, hippest pair I’ve ever owned (and the cool factor has pretty much declined ever since). Those first shoes were Detto Pietro Art 76s. Say that a few times. DETT. Oh. Pee. AY. Tro. Art. 76. I got them used. The uppers were black leather with holes for ventilation. “DETTO” was slapped on in simple white letters that peeled off over a period of months until the shoes were completely blank. The soles were wood, very much like what you saw in the photo above. The cleat had a slot that went over the back edge of the pedal cage. The modern cyclist might well ask, “But what about float?” Float? Hah! The cleat wasn’t even adjustable! It was nailed on! You’d ride for awhile without a cleat, the toe clip keeping the shoe in place, and the pedal cage would make a black mark on the wood. Then you took it to Perry’s Shoe Shop in downtown Boulder, and Perry himself—the trusted cobbler for the entire Boulder cycling community—would position the cleat and nail it down. One time I broke a pedal cage, so the two broken pieces overlapped. I didn’t realize what had happened until (with great effort) I pulled my shoe free only to find the cleat stuck there on the pedal, all the nails pointing up. Yikes! Compared to those Art 76s, my next shoes, the Detto Pietro Art 74s (hand-me-downs from my brother), were high-tech. The sole was plastic, and featured a fancier logo that wouldn’t come off. Best of all, the cleat screwed onto a base plate (which I believe was still nailed on) so it was adjustable. As you can see, there was only one bolt, making the cleat vulnerable to rotation over time, so there were still holes in the cleat to accept nails, once you got the adjustment perfect. What about replacing the cleat? Well, my feet were growing so fast, I never needed to. 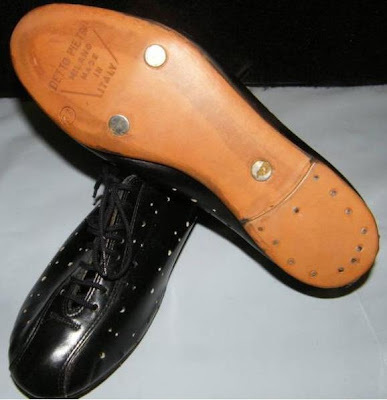 I remember snipping the leather in the back, where it was biting into my heel, to extend the life of the shoes a bit. The next shoes were Duegis, with a weird logo of two shimmering disks with the kind of pattern that could hypnotize you. I loved them too. The first really ugly shoes I had came a few years later, and they were my first French shoes, Rivats. They were this horrible red color with black accents. I got them for $10 from a shop that was on its last legs. They were heavy, and practically carpeted inside, and did I mention ugly? But they were really comfortable, and really stiff. And ugly. This was the summer of ’89, which I spent in Boulder. Was Perry’s Shoe Shop still there? It was. Could Perry dye my shoes all black? He could, and did. The coolest old-school shoes I know of that are still on the road are my brother Bryan’s Vittorias. He bought these during the late ‘90s from a pal at the bike shop who’d had a hard time finding them back then. As Bryan recalls, “He ordered them special, as you know…. He tried them on and after several seconds declared them no good, so I saw it as an easy opportunity to get some shoes without having to do research, order, wait, and all that.” They’ve been Bryan’s only cycling shoes ever since, and have given him very few problems. “Sometimes they’re just amazing. After a really long ride, sometimes it’s like they’re massaging my feet. Other times, though, particularly if it’s cold out, their thin leather and numerous vent holes cool my wussy feet too much, so it feels like my feet are tightly bound to slabs of icy marble.” They sure sound stiff, don’t they? “One of the laces started wearing out about ten years ago,” Bryan says, “so I avoid the tenuous thin bit when I tie it, using only half a bow. It works, though.” He brought the shoes into a bike shop recently to get new cleats for them, and one of the employees came up and said, “That’s a beautiful shoe! Do you mind if I look at it?” The guy proceeded to fondle the shoe for a few moments. Fast-forward to the most modern shoes I’ve ever seen. If you’ve been paying attention you know I don’t consider looks to be a big deal when choosing my shoes, which is how I ended up with a pair that look like the cheap plastic shiny shoes you rent with a tuxedo, but with stripes added. The S-Works shoes really are cool, though. Instead of shoelaces or Velcro they have these little knobs. The knobs wind or unwind these little cords—wires, I guess you could say—that are like fishing line and criss-cross over the tongue of the shoe. (The tongue, though thin, is densely padded and keeps the wires from biting into your feet.) The knobs click as they turn, in either direction, giving you very precise control over how tight the shoe fits. The knob system is a rare example of something that looks like pure gimmickry but actually does work. And the shoes are conspicuously well ventilated. And stiff, stiffer than anything I’ve ever worn. They beg the question, Can a shoe be too stiff? No. As it turns out, the stiffer the better. Dang. Of course, you may decide this is cognitive dissonance: having shelled out so much money, I’d be embarrassed to admit the shoes sucked, even if they did. I’ve seen many examples of this, particularly the people quoted in the news as saying they weren’t bothered a bit by paying $100 more for their iPhones than those who bought them a month or two later. But that’s not me—I was cursing those Carnacs from day one! These S-Works shoes are the real deal (though I won’t know for sure if they were a good buy until I see how long they last). I know, you’re tired of reading, and the text-to-picture ratio is nowhere near the “Us” magazine you’re used to. So here are some photos. First, the Carnac Quartz, bristling with straps and looking like a banana fortified with electrical tape. From above these look like clown shoes. The toe box is absurdly wide. Not for nothing did I include the food scale in the photo: at 470 grams, these shoes are over a pound each! 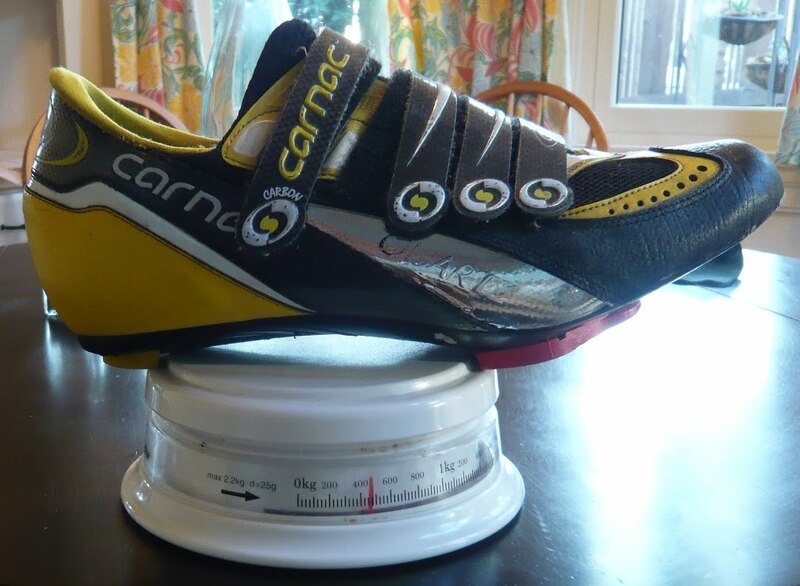 That’s not just heavy for a cycling shoe, but for anything but a steel-toed work boot. Man, what was I thinking? And what were they thinking? 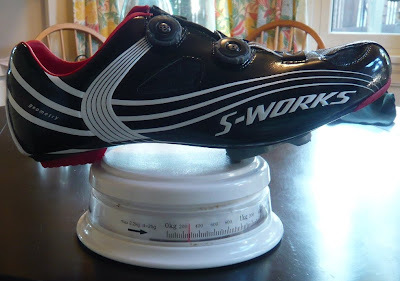 That said, the S-Works shoes look to be well made (in China). And through sheer luck, the color and stripe pattern match those of my daughter Alexa’s new soccer cleats, and that’s fun for both of us. And look at that weight: 275 grams! Another 6.7 ounces of weight savings over my last shoes (and 14 ounces over the Carnacs!). That’s not a minor difference, people: angry bikers routinely spend many hundreds of dollars dropping a couple ounces from their bikes. And remember, shoes are rotating weight. How about another longing look at those sweet Vittorias? Here’s some better detail, along with the all-important weight statistic. As the appropriately old-school scale attests, these bad boyz weigh in at a respectable 325 grams each—lighter even than the Specialized Pros. Still, these shoes have had their moments. At a gala NorCal Mountain Biking League fundraiser, a famous retired bike racer (a childhood hero of mine) paid Erin what struck me as undue attention, and it wasn’t for her knowledge of, or interest in, bike racing. The Sergio Rossi shoes doubtless contributed to her fine silhouette that evening. Whether or not you love the look of the Sergios, their dominance in the weight category cannot be disputed. At a feathery 180 grams, they blow even the S-Works out of the water. They look a lot more aerodynamic as well, and appear to be plenty stiff too. Hmmm … I wonder if Perry’s Shoe Shop will still nail cleats to shoes. You think they could do leather soles?